Only model in its class to come with Automatic Post-Collision Braking System standard across the range. 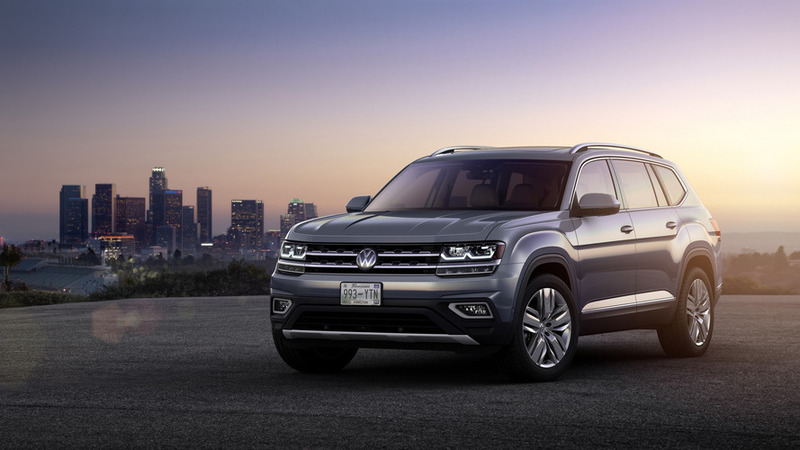 The Insurance Institute for Highway Safety has awarded the new 2018 VW Atlas with a 2017 Top Safety Pick, but only for the versions equipped with Forward Collision Warning and Autonomous Emergency Braking. 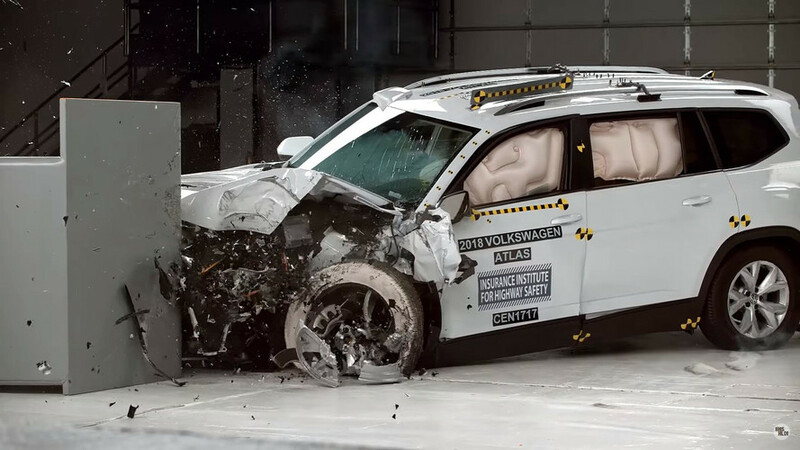 The three-row SUV earned a “Good” rating in the five crash test categories established by IIHS: small overlap front, moderate overlap front, side, roof strength, and head restraints & seats. To be eligible for a Top Safety Pick award, a vehicle must have the aforementioned AEB system with at least an “Advanced” rating for the front crash prevention, which the Atlas managed to surpass by earning a “Superior” rating from IIHS. 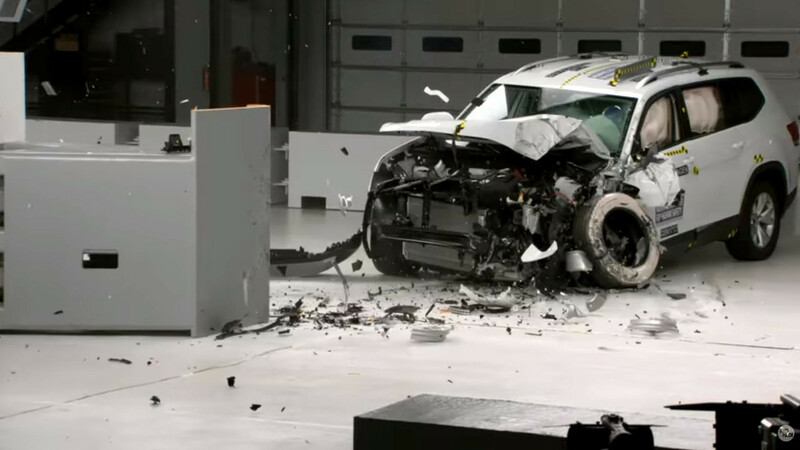 During the test conducted at 25 mph, the impact speed was diminished by a considerable 17 mph, thus greatly reducing the risks of more serious injuries. In the 12-mph test, it avoided a collision. However, the midsize SUV missed out on the Top Safety Pick+ because of its “Marginal” or “Poor” headlights, depending on trim level. To claim the TSP+ title, the 2018 Atlas would have needed “Good” or “Acceptable” lights. Some of its segment rivals have scored the TSP+ award, such as the Honda Pilot, Hyundai Santa Fe, Toyota Highlander, and the Mazda CX-9. $30,500 will buy you a base 2018 Atlas, but you’ll have to fork out more cash for some of the safety and assistance systems. The good news is VW won’t charge you extra for the Automatic Post-Collision Braking System as it comes as standard across the range and makes the Atlas the only model in its class to have it even on the entry-level version. Extra kit for those willing to spend more on safety tech can include everything from adaptive cruise control and parking steering assistant to an overhead view camera and high-beam control, just to name a few. The 2017 TOP SAFETY PICK award is issued to vehicles that have earned “Good” ratings in IIHS crash tests evaluated in five categories: frontal impact moderate overlap; frontal impact small overlap; side impact; roof strength; and head restraints. It must also offer an autonomous emergency braking system (AEB) that earns at least an advanced rating for front crash prevention. The 2018 Atlas earned a “Superior” rating on the AEB test. The Atlas is the only vehicle in its class to offer the Automatic Post-Collision Braking System, which is standard across all trims. This system builds on the premise that a collision is rarely a single, instantaneous action, but rather a series of events that follow the initial impact—the most significant of which can cause additional collisions. The Automatic Post-Collision Braking System addresses this by applying the brakes when a primary collision is detected by the airbag sensors, thus helping reduce residual kinetic energy and, in turn, the chance of additional damage. Other driver assist systems available in the Atlas include Adaptive Cruise Control (ACC); Blind Spot Monitor with Rear Traffic Alert, Lane Departure Warning (Lane Assist), front and rear Park Distance Control (ParkPilot), Parking Steering Assistant (Park Assist); High Beam Control (Light Assist) and Overhead View Camera (Area View).